At Sprouts, we pride ourselves on our unwavering commitment to providing our customers with friendly, knowledgeable and engaging service to support them on their healthy living journeys each and every day. Our commitment to friendly service doesn’t stop at our stores. We pledge to be a good neighbor in every community we serve through volunteer work and local event support. Each year, our direct and in-kind donations help local nonprofit organizations, food banks and service groups touch millions of lives to help make our world a better place. Our team members inspire, educate and empower our customers to live healthier lives through various in-store, online and community events. See what’s happening next in your neighborhood! Want Sprouts to be part of your event? Complete our Donation Application and provide a copy of your non-profit beneficiary’s 501(c)(3) status. Sprouts participates in the SCRIP Fundraising Program to help nonprofit organizations by offering Sprouts gift cards at a 5% discounted rate which can be re-sold at full price to raise funds. 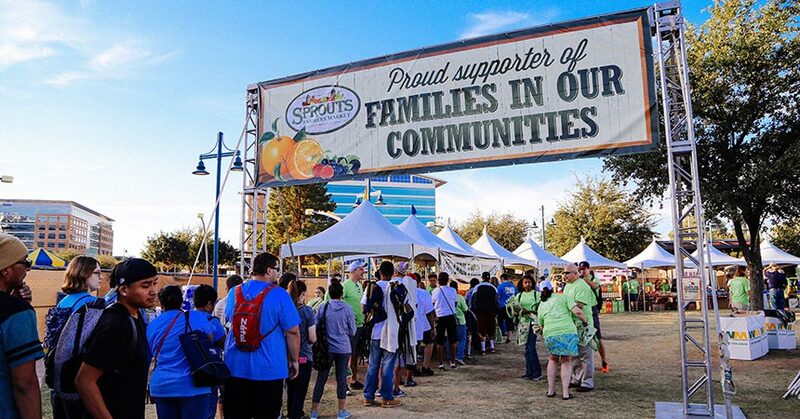 Founded in 2015, the Sprouts Healthy Communities Foundation extends our community involvement by supporting health and wellness related causes that directly impact the neighborhoods where our customers and team members live, work and play. We focus on giving locally in the areas of food security and hunger relief; promoting health education and nutrition; and helping people living with disabilities and health concerns. We are proud to partner with numerous organizations, including REAL School Gardens, Vitamin Angels and Autism Speaks.